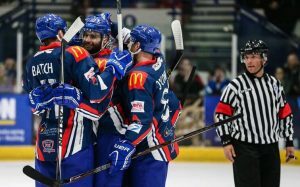 Junior ice hockey players are being offered a fantastic discount via their clubs to watch Great Britain’s international challenge games with Poland in April. The two sides meet at the National Ice Centre in Nottingham on Friday 14th April (7.30pm) and then again in Coventry’s Skydome the next day, Saturday 15th April (1.00pm). Ice Hockey UK, with the support of the EIHA’s Junior League Management Committee (JLMC), are pleased to offer the following discounted ticket price for club and team group bookings. Registered junior players can gain admission to the games for only £5 and four accompanied team staff members will go free. Tickets for any extra adults will cost only £10. Bookings, which will be taken on a first come first served basis, must be made before Friday 24th March and space is very limited in Coventry. If available space at Coventry is taken, Nottingham will be offered instead. Chair of JLMC, Jacqueline Pye, said: “We are pleased to be able to offer junior players and their clubs a great discount for the two GB games. Great Britain general manager, Andy Buxton, said: “Making our national team accessible to young players is very important. IHUK general secretary, Andy French, added: “This is a fantastic intiative for the sport’s young players to watch top-class Great Britain players.